… is a large group of people from points all across the Trans Pennine Trail (and beyond) who believe it to be a brilliant facility and wish to get involved to help promote and protect it. 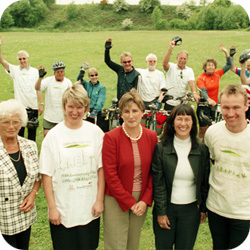 We are therefore an active group who support the TPT office and local authorities on their work for the Trail. This support takes many forms, including spreading the word, doing presentations on the Trail, attending shows and events to help promote the TPT and keeping the office informed about what users think. We also campaign for the Trail and lobby agencies in order to protect it from conflicting proposals such as development on an existing section of Trail and champion potential improvements to the route. Some Friends also act as Volunteer Rangers, visiting their section of Trail regularly and acting as the eyes and ears of the TPT project. We also have many members who just wish to keep informed about and support the TPT and join the Friends in order to do so. Not everyone needs to be an active member. If you feel that the TPT offers you something great – be it for a quiet walk, an excursion on your horse or a bit of exercise on your bike please join us. Whether you simply want to support us or are keen to be active, we don&#8217;t mind. Membership fees are used to support our work and also to keep everyone informed through the newsletter Up and Over. Membership costs just £6 a year for ordinary members; £4 for unwaged/concessions; £10 for family/joint/clubs. If you&#8217;re visiting this page and would just like to know how you can make a donation to ensure the Trail is protected for our future generations to enjoy just visit our donate section Weitere Informationen.